Why 4X9 Magnets Are Used for Sending Invitations in Style? They easily show up from over the refrigerator door or other surfaces due to their large size. Many reputable online stores stocking promotional magnets offer free full color printing. Free shipping, free art setup, and free online design proof are some value added benefits offered by ecommerce stores stocking made in USA 9×4 magnets. 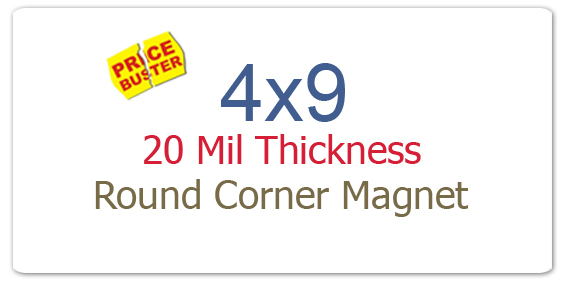 Individuals can enhance their savings by bulk ordering these customized magnets. High quality production (only a feature of an ecommerce store stocking made in USA magnets) with a colorful presentation makes these customized magnets a stand out in the crowd. Full color save the date wedding magnets might end up becoming a keepsake and people retain them as a memoir once the event passes by. 4×9 magnets can be utilized to print the wedding information complete with venue details and theme of the occasion. Remember save the date wedding magnets not only become the pre-invitations, but they also set the mood for the occasion. A retirement is usually a milestone affair as a birthday, wedding, and any other event. Retirement announcements are special because they bear expressions of contentment, happiness, sadness, and mixture of all other feelings. Anyone experiencing the same rush of feelings can stick to 9×4 magnets for expressing their gratitude, solitude or anything they want. They can buy attention with the choice of sentences, images, and venue for their retirement party. People would retain emotional and full color magnetic announcements as a memoir. Many people take it to social media platform, other digital mediums and newspaper columns to announce the arrival of their newest family member. Now, parents can enjoy a great time by working over stylized announcements through 9×4 magnets. They can custom it with the image of the newborn, weight and other details. People retain such information with great enthusiasm. It is also perfect for the parents who are awaiting arrival of their dear one. Graduation announcement are the opposite of retirement because it marks the end of a student life and signals the arrival of a new job hunter on the block. Over the years, people were largely relying on SMS, mails and other digital mediums to announce their big day in style. However, today, they are finding joy by doing it over full color 9×4 magnets. If you are the one awaiting that big day and wish to spend it in the company of all your loved ones, feel free to do so by announcing it through customized 4×9 magnets. 9×4 magnets easily serve as a carrier of thousand expressions and you can customize them the way you want to announce that special event or day in style!